Is your IP and data secure? How exposed are you to attacks? How resilient are you to a disaster? Do you have appropriate policies and processes? Are people making best use of your IT tools? Rather than simply reviewing what you’ve got, we uncover what you should be doing with IT to improve your business. Scalable depending on your needs, choose from just a simple review, to the starting point for a strategic IT plan in a comprehensive 20 page report. The review includes pricing indications, so you know the cost implications of identifed issues. Working through more than 150 diﬀerent elements, our process ensures your output report focuses on the areas relevant to your business strategy. We focus on ‘why’... not ‘what’. We help you identify the IT priorities for your organisation. These are the things you need to focus on to achieve your strategic and short term goals. No stone is left unturned. 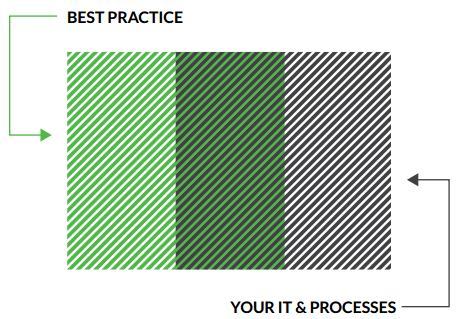 Our comprehensive process ensures that you consider every aspect of your IT. 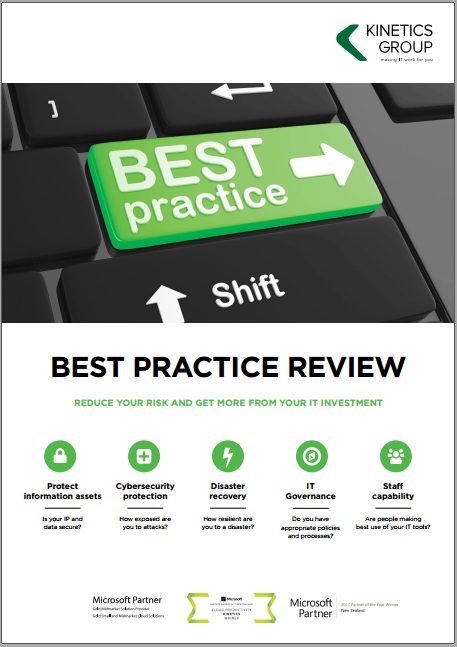 The Best Practice Guide gives senior executives and Directors a crystal clear view of how they are managing the risks and benefits of IT for their organisation.